When grit and resilience and not accepting the cards you are dealt prove you can beat the odds. We chat with serial entrepreneur Dorothy Foster who after many business adventures now works as a consultant and advisor for students considering future career choices and University options. What a full and colourful background Dorothy Foster shares with us. We start with her background in Liverpool, UK and her early education, the challenges and how she turned things around. Dorothy went back to studying, was able to go to university and even later on went on to complete 2 Masters. She has first hand business experience in the Fashion world, running a nightclub, voluntary roles in business networking groups like PWN and Riviera Business club. More recently she was the Director of the International School in Nice before moving to Ceram / Skema and taking on the role of Business school International University partnerships. A believer in ongoing education Dorothy went on to study Psychology. 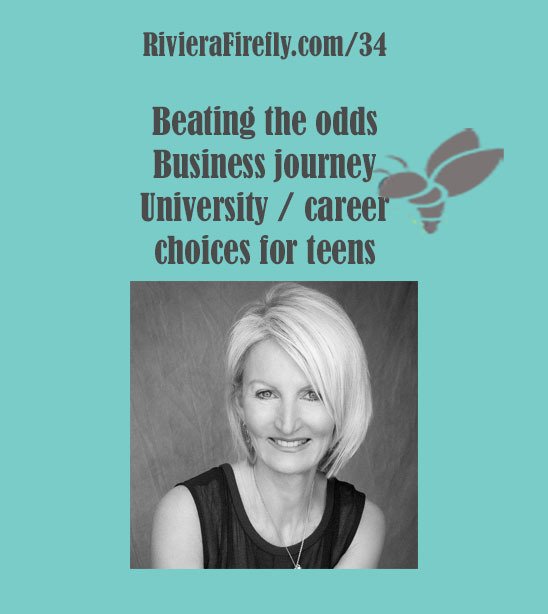 Dorothy’s most recent venture pulls all her business experience together offering students help, advice and guidance with their future career choices and univerNew business now deals with University choices and guidance for students. How does a session with Dorothy run? Do a sponsored event to raise money for a charity!